In a previous post, I discussed how Western European societies used to postpone the age of first reproduction to the mid-20s. When this cultural pattern began is unsure, but it certainly preceded the Black Death of the 14th century and may have existed as early as the 9th century. It seems to have resulted from a combination of land scarcity and the rule of primogeniture, i.e., farms were kept intact and handed over to the eldest son when the parents died or retired. In such a situation, young couples had to wait until they had a farm of their own—and the means to start a family. How late can a woman postpone having her first child and still be sure of perpetuating her lineage? In her mid 30s? That answer might be true today. In pre-modern societies, however, women had to start earlier. A recent study by Liu and Lummaa (2011) puts it no later than 30. Beyond 30, a woman would be faced with declines in both offspring quantity and offspring quality. Her risk of genetic extinction was proportionately higher. In a study of rural Finnish parish records from the 18th and 19th centuries, Liu and Lummaa (2011) found that the women were 26 years old on average when they first gave birth. They had thus foregone the first decade of their reproductive life, something that would be unheard of in most traditional human societies. Yet they nonetheless managed to have 6.54 children on average. Among these women, offspring quantity decreased with increasing age of first reproduction (AFR). This was partly because the time window for reproduction was narrower and partly because more of the reproduction was taking place during years of reduced fertility. Offspring quality held constant until the age of 30 and then too decreased. The study defined “offspring quality” as the probability that one’s children will survive to adulthood and have children of their own. On average, 60% of the offspring survived to 15 years of age and 47% had children of their own. AFR did not affect offspring quality among mothers under 30. Over 30, higher AFR was associated with a lower probability of the children surviving to adulthood and a lower probability that the surviving children would have families of their own. Why did fewer of these children survive to adulthood? The data provide no direct answers. One reason may be that older mothers tend to have children with lower birth weights, which in turn may lead to early death. Older mothers are also at risk of having children with birth defects. And why did fewer of the surviving children have children of their own? Again, the data provide no direct answers. It may be that many of these children were physically or behaviorally compromised and thus less able to attract potential mates. In today´s society however, women do not start childbearing until an older age as marriage is often delayed, and casual or short-term relationships and divorce are more common. As a result, the natural selection maintaining young-age fertility might weaken and the relative strength of natural selection on old-age fertility could increase, something that could potentially lead to improvements in old-age fertility over many generations. Liu, J. and V. Lummaa. (2011). Age at first reproduction and probability of reproductive failure in women, Evolution and Human Behavior, 32, 433-443. 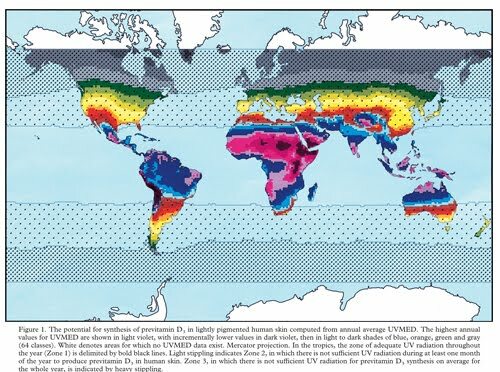 Annual average exposure to erythema-inducing UV radiation at ground level. Source: Jablonski & Chaplin, 2000. At high northern latitudes, vitamin D can be obtained only from one’s diet, notably fatty fish. Yet many northern native peoples consume little fish. Have they evolved a different vitamin D metabolism? I’ve just published an article on population differences in vitamin D metabolism, specifically about northern native peoples. Comments are welcome. Vitamin-D deficiency seems to be common among northern native peoples, notably Inuit and Amerindians. It has usually been attributed to: 1) higher latitudes that prevent vitamin-D synthesis most of the year; 2) darker skin that blocks solar UVB; and 3) fewer dietary sources of vitamin D. Although vitamin-D levels are clearly lower among northern natives, it is less clear that these lower levels indicate a deficiency. The above factors predate European contact, yet pre-Columbian skeletons show few signs of rickets—the most visible sign of vitamin-D deficiency. Furthermore, because northern natives have long inhabited high latitudes, natural selection should have progressively reduced their vitamin-D requirements. There is in fact evidence that the Inuit have compensated for decreased production of vitamin D through increased conversion to its most active form and through receptors that bind more effectively. Thus, when diagnosing vitamin-D deficiency in these populations, we should not use norms that were originally developed for European-descended populations who produce this vitamin more easily and have adapted accordingly. Jablonski, N.G. and G. Chaplin (2000). The evolution of human skin coloration, Journal of Human Evolution, 39, 57-106. In the 17th and 18th centuries, settlers emigrated from land-poor France to land-rich Canada. The result was a lower age of marriage. Young men and women no longer had to wait for their parents to hand over the family farm. Land was plentiful, and early family formation much easier. This new social reality led to a new biological reality. From one generation to the next there was a steady contraction of the time between age of marriage and age of first birth. Married women—many as young as 15— were getting pregnant faster. The mean age of full reproductive maturity seems to have slowly fallen at a steady rate, apparently through the reproductive success of women who could better exploit the opportunities for early family formation (Milot et al., 2011). This pattern of late marriage may have been accentuated by the Black Death, but it was already present beforehand. Hallam (1985, p. 56) cites additional evidence for late marriage farther back in 9th-century France. On the estates of the Abbey of St Germain-des-Prés near Paris, about 16.3% of all adults were unmarried. In Villeneuve-Saint-Georges, the figure was 11.5%. Seccombe (1992, p. 94) cites a 9th-century survey of the Church of St Victor of Marseille, where both men and women appear to have married in their mid to late twenties. So when did the Western European marriage pattern begin? I suspect its origins lie in the late Neolithic of Western Europe, when farming communities had reached a saturation point. With farmland in short supply, young men and women had to wait their turn before they could marry and have children of their own. And some would never marry. What happened to these never-married? They may have turned toward community service of one kind or another. If they couldn’t have children of their own, they would’ve invested their energies in helping others of their community—who were often their kinfolk. In this respect, the Catholic Church may have simply adopted and further developed a cultural pattern that was already present in Western Europe. By the early Christian era, this pattern was clearly in evidence: monks and nuns dedicated their lives to creating centers of learning and, eventually, colleges and universities. They also founded hospices for the sick and injured. Much of what we now call the ‘welfare state’ has its origins in the work of these celibate men and women. 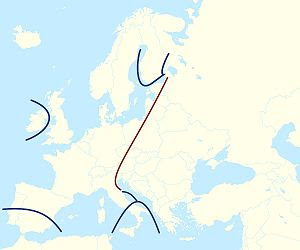 Did this marriage pattern shape the biology of Western Europeans through natural selection? Was there gene-culture co-evolution? This is likely with respect to the pace of sexual maturation. Keep in mind that the time between menarche and first birth was ten to twelve years on average. Nature abhors a vacuum, and there would have been a tendency to slow the pace of sexual maturation for both biological and psychological traits. Just as land-rich North America selected for successful pregnancy at younger ages, the reverse had probably happened in land-poor Europe. Hallam, H.E. (1985). Age at first marriage and age at death in the Lincolnshire Fenland, 1252-1478, Population Studies, 39, 55-69. In human genetics, a ‘population’ is a group of individuals who share ancestry and hence genes. This sharing is not absolute. There is always some gene flow from outside, and sometimes “outside” means another species. We humans, for example, have received genes not only from Neanderthals and Denisovans but also from … viruses. In addition, new gene variants are constantly arising through mutation. Most of them are harmful or useless. But some are useful and will thus spread through the population. So below the species level, and often even at the species level, population boundaries tend to be fuzzy. Genes vary both between and within populations. 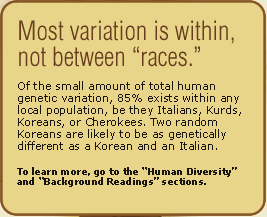 You’ve undoubtedly heard that there is much more genetic variation within human populations than between them, this being true even for the large continental populations we used to call ‘races.’ This was the finding of the geneticist Richard Lewontin (1972), and others have concluded likewise. You’ve probably not heard, however, that the same kind of genetic overlap exists between many sibling species that are nonetheless distinct in anatomy and behavior (Frost, 2011). How come? First, keep in mind that genes vary a lot in adaptive value. Some are little more than ‘junk DNA.’ Others code for structural proteins that form the building blocks of flesh and blood. Others still are very important because they code for regulatory proteins that control how other genes behave and, hence, the way an organism grows and develops. The last kind of gene accounts for only a tiny fraction of the genome. Most genes have modest effects, or none at all. Second, keep in mind that different populations occupy different environments and are thus exposed to differences in natural selection. In most species, these differences are due to physical environments that differ in climate, vegetation, and wildlife. Humans also have to adapt to cultural environments that differ in social structure, belief systems, and technology. In either case, when a gene varies between two populations the cause is probably a difference in natural selection, since the population boundary also separates different selection pressures. Conversely, when a gene varies within a population this variation is less likely to have adaptive significance. It hasn’t been flattened out by the steamroller of similar selection pressures. This is one aspect of “Lewontin’s fallacy.” Within-population variation isn’t comparable to between-population variation. It’s like comparing apples and oranges. Another aspect of Lewontin’s fallacy is that natural selection within a population exercises a leveling effect only on phenotypes, and not on genotypes. If two gene variants have a similar phenotypic effect, natural selection will take longer to replace one with the other. Sometimes, this sort of diversity will persist indefinitely because epidemics often spare individuals whose surface proteins are somewhat different from those of their neighbors. Thus, within-population variation tends to consist of different gene variants at different loci whose effects nonetheless point in the same general direction. To some degree, these variants can stand in for each other. If one is absent, another one might do the trick. This is probably why population differences are more sharply defined if several gene loci are compared simultaneously. If we chart how each gene varies geographically and then superimpose these maps on top of each other, the resulting composite map will show population differences in sharper relief (Edwards, 2003; Mitton, 1977; Mitton, 1978; Sesardic, 2010). This point has been made by Emmanuel Milot, the principal author of the paper I reviewed in my last post. His research team found that the time between marriage and first birth steadily shrank among succeeding generations of French Canadians on Île aux Coudres (Milot et al., 2011). In the land-rich environment of the New World, there was strong selection for married women to get pregnant faster. A genetic difference has thus developed between French Canadians and the French who remained in France. This point is important. If two populations differ at one gene, and if the difference is sensitive to natural selection, they probably also differ at many other genes. The same selection pressure that caused one difference has almost certainly caused others. Typically, we see only the tip of the iceberg—a gene variant that produces an obvious effect in affected individuals, such as illness. Most gene variants, however, don’t cause medically recognized illnesses, and their effects also tend to be subtler. Edwards, A.W.F. (2003). Human genetic diversity: Lewontin’s fallacy. BioEssays, 25, 798-801. Lewontin, R.C. (1972). The apportionment of human diversity. Evolutionary Biology, 6, 381-398. Mitton, J.B. (1977). Genetic differentiation of races of man as judged by single-locus and multilocus analyses, American Naturalist, 111, 203-212. Mitton, J.B. (1978). Measurement of differentiation: reply to Lewontin, Powell, and Taylor, American Naturalist, 112, 1142-1144. Sesardic, N. (2010). Race: a social destruction of a biological concept, Biology and Philosophy, 25(2), 143-162.